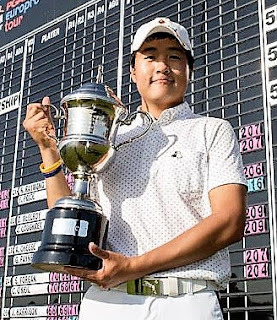 Min Kyu Kim, a 16-year-old South Korean, claimed his second title in as many weeks at the PGA EuroPro Tour’s FORE Business Championship at East Sussex National Golf Club today. Kim was the firm favourite heading into the final round after equalling the course record in his second round, carding a superb -9 (63). 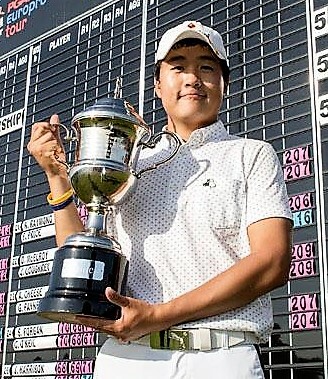 However, the South Korean blew the title race wide open after three bogeys in his last three holes, which meant a play-off with Niall Kearney (Royal Dublin). Kearney was deserving of a play off at least, after he finished 12-under par, carding an excellent -8 (64) final round in the process. Both players parred the first play-off hole, before Kearney bogeyed the 18th on the second attempt which Kim comfortably putted for par. “I’m so happy with my second win, I played really well up until my final three holes”: said Kim, who wins £10,000 as well as a brand new Motocaddy S3 PRO electric trolley with lithium battery, Bushnell Pro X2 Range Finder and Bolle sunglasses. Kim climbs to 2nd in the Race To Amendoeria with three events left, and faces a very real chance of challenging for the £250,000 four-win bonus, with current leader Chris Lloyd, in his current form. Elsewhere, Dermot McElroy (Ballymena Golf Club) shot an impressive six-under par 66 final round to tie third place with Conor O’Neil (Mearns Castle Golf Academy) who shot a five-under par final round of 67. McElroy and O'Neil earned £2,500 apiece. Highlights will air on Sky Sports Golf on Tuesday, September 5. The PGA EuroPro Tour continues with the Jessie May World Snooker Golf Championship at Collingtree Park Golf Club, Wednesday, August 30 – Friday, September 1. 204 Niall Kearney (Ireland) 68 72 74, Min Hyu Kim (S Korea) 68 63 73 (Kim won at second play-off hole. 205 Dermot McElroy (Ballymena) 68 71 66, Conor O'Neil (Mearns Castle) 70 68 67. 221 John Henry (Clydebank and Dist) 75 68 78 (56th).